Dine in style with this three-piece bistro set from Carbon Loft. Each set consists of one bistro table and two counter-height stools that can also double as bar or kitchen island stools. The seats feature a contoured design for added comfort during meals or coffee talks. I have a cabin with a very small eat in kitchen and no dining room space so I bought this piece and also 2 extra bistro stools. The table top is probably a little too small for 4 but is functional especially for a small space. The stool legs stick out so had to stub toes awhile before we got used to them. I'm 5'7" and the stools are a little too high for me. If I could have a do over, I'd look for a counter-height set. The table went together easily but was not very sturdy and was a little wobbly. I bought 4 of these chairs. On the 1st 2, the metal screw holes didn't line up on the frame of the chair. I was careful not to screw everything in all the way until the end, so as to leave some room to adjust as needed, but they were still off by 1/2" - 3/4" on each stool. The 3rd stool was shipped broken as the screws on the back of the stool had ripped out. I didn't bother opening the 4th stool and requested a refund. On the plus side, Overstock's customer service is by far the best I have ever dealt with. They were apologetic, sent UPS to pick up the items (after I had to repackage them which is a nearly impossible task), and issued me a full refund within a few days. I would not hesitate to shop at Overstock again. The table and stools look very nice, but unfortunately didn't work for me. Just as pictured. High quality, modern and affordable furniture which is a good buy. While it does take some time to put together, the instructions are easy to follow and except for two striped screw holes "out the box" (fixed them by using glue and wrapping the screw with tape) all pieces were there and it looks nice. Comes in three separate boxes (one for each chair and the other for the table) which are a little on the heavy side which translates into getting quality pieces. I would make this purchase again. I love this table. It’s heavy, good quality table and chairs. I think it’s worth the cost for sure and I would recommend it to anyone looking for a bistro set. I love this Bistro set it is perfect for my small apartment. The set is very sturdy and is beautiful in my dining space. I looked for a long time to find a 30 inch bar height table and and chairs and I finally found it. Ordered on Monday and Arrived on Thursday Free shipping. Put in all together in less than 30 minutes you would never know it came it parts. It is Beautiful and very sturdy perfect for my small kitchen. I would order this again. Needed small table for space and worked out great! This Isa very good set for smaller space. 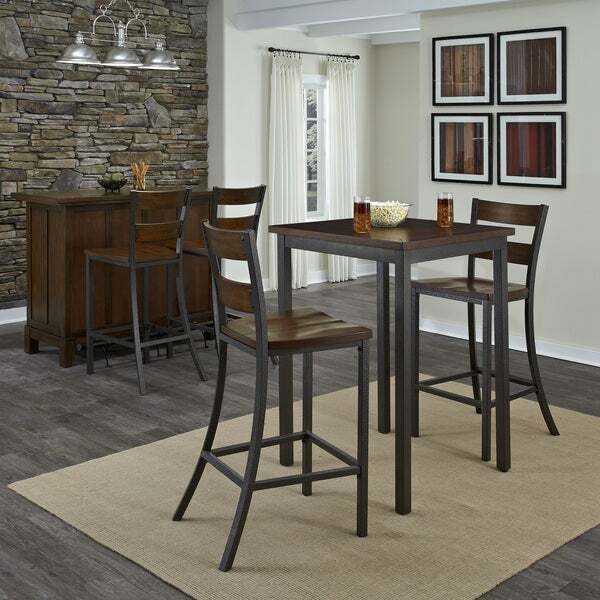 The chairs are very heavy duty and the table height is perfect. I would use this set in a kitchen setting area or as part of a bar. Easy to put together. Very sturdy. Lots of compliments. This table sits high and is perfect for two. Very sturdy! Love the look! Love this set! Well made, and beautiful. You will need a drill to attach the seat on each chair, otherwise, very easy to assemble. Great set. Sturdy, heavy, very attractive. I had no issues putting together. Definitely worth the money. 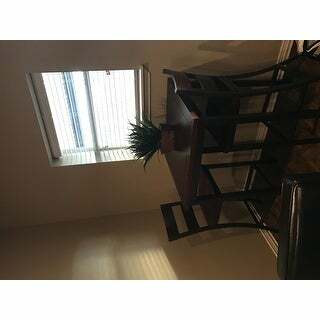 The table and chairs look great and it is a comfortable place to dine and work. The size really opened up space in my dining area. It has worked out great for me. Very happy with this purchase. Too much packing material, too many boxes. Chair seats have no holes drilled in them for the screws. Company does not return phone calls. Perfect smaller table and chair duo. Contemporary styling, neutral color tones of the wood. Very impressed with quality! Sturdy construction! "what is the height of chairs from floor to seat? Can extra chairs be ordered?" You can find additional chairs under item# 15733817. The chairs have a seat height of approximately 30 inches. We apologize but do not have information regarding the weight limit of this item. "I LOVE this Table as you can see in my comments from a few weeks ago. Sadly this table at 42 inches in height is just to large for my Kitchen. Any chance you can help me find something in a 30 inch Counter Height table? that is similar. Thank you, ya never know unless you ask." Hello sendittojeff, we do apologize, we are not currently in stock with a similar model in featuring a 30 inch height. Please feel free to contact us again with any further questions. Please see ITEM# 12080906 for one of my favorite sets Thank you for shopping with us! "Is there an item number for the bar that is in the picture with the pub table? I would like to purchase." Hello KC726, unfortunately, I was unable to locate the bar within our inventory. Please let us know if you have additional questions. Thanks for shopping with us. Nice color and size to fit into my kitchen space. It appears to be the right height, and built well. We'll see when it arrives though. I hopeful it will be exactly what I'm looking for. "Can this Bistro set be used outside? Will the materials hold up in the outdoor environment?" This bistro set is not suitable for outdoor use.